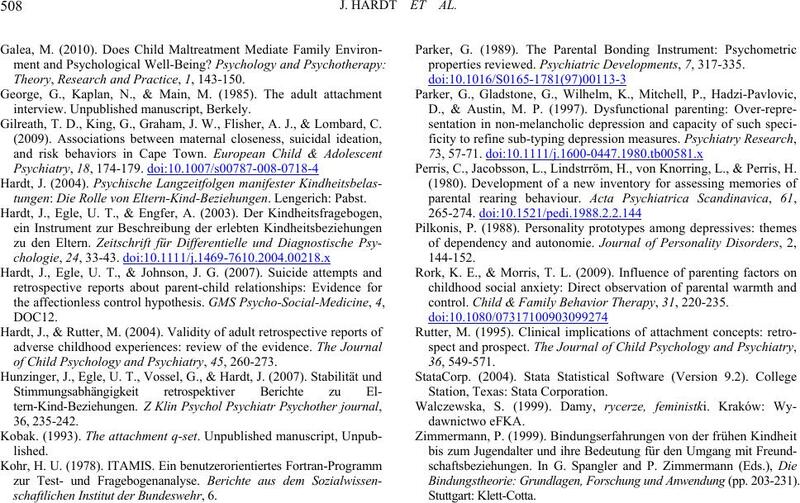 4FB 2: Psychology, University of Paderborn, Paderborn, Germany. Received February 17th, 2011; revised April 26th, 2011; accepted June 2nd, 2011.
spondents of the two coun tries can be explained as a function of history. mother. In this standardised stress situation, Ainsworth et al. added, style D (disorganised) (Ainsworth & Eichberg, 1991). scales concept. The questionnaire can be viewed at www. screening4you.de in English, Polish, and German. which contains about 60 items, appeared last in the set of items. questionnaire was interesting to fill out. each country was female. The majority had a spouse or partner. samples are displaye d in Table 1.
analyses become unstable when so many interactions are tested. 7;1000 df. So df. are not reported. No trends were interpreted. 0.69; all the other scales displayed good to excellent values. “should not fail”) had a higher correlation with the scale “control”. 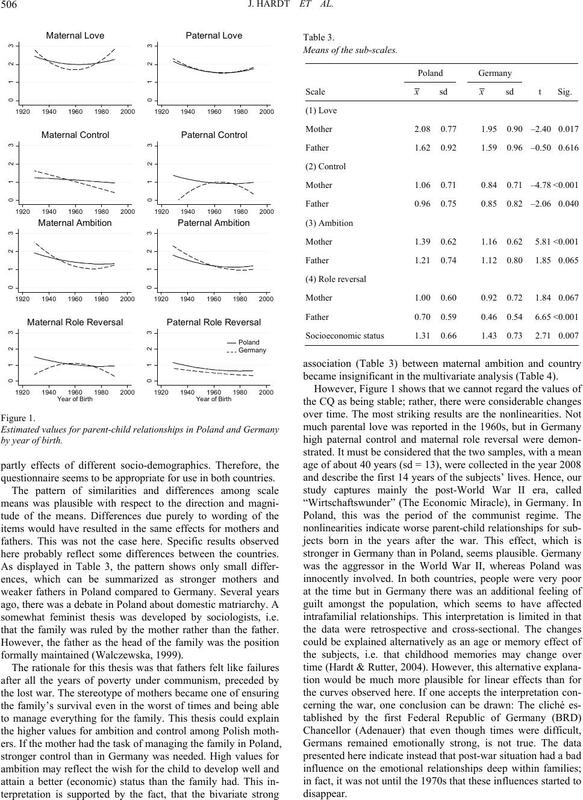 Both items discriminated weakly among Polish fathers as well. Cronbach’s alpha for sc a l e s a n d c o r rected convergent and divergent correl ations for items. my father” (t = 3.84, p < 0.001). and item 12, “My mother spied on me” (t = 11.43, p < 0.001). 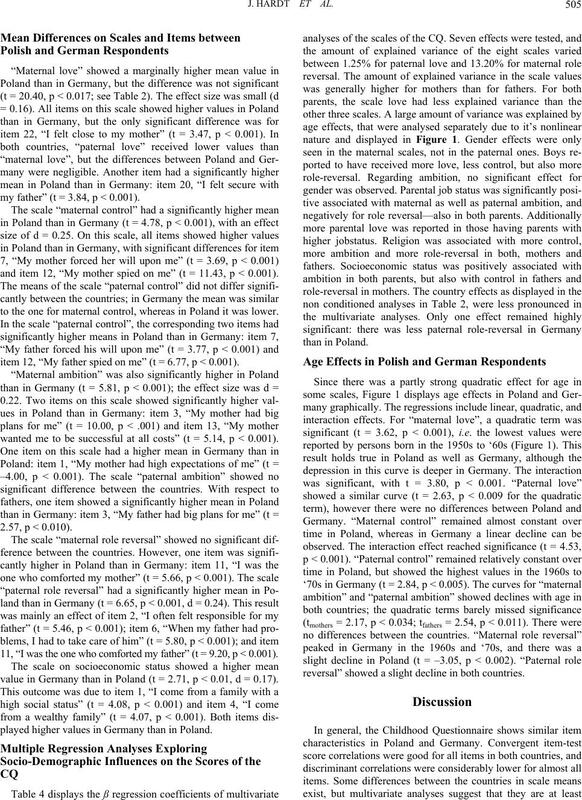 to the one for maternal control, whereas in Poland it was lower. item 12, “My father spied on me” (t = 6.77, p < 0.001). wanted me to be successful at all costs” (t = 5.14, p < 0.001). 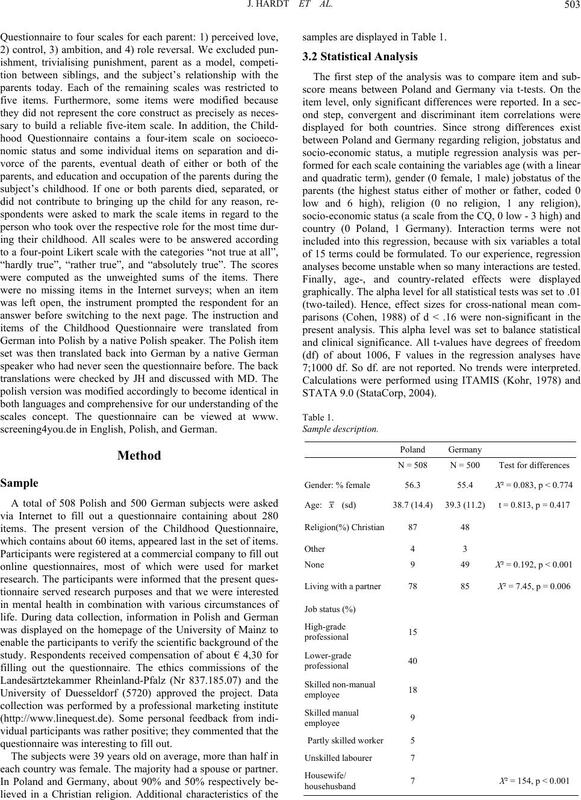 11, “I was the one who comforted my father” (t = 9.20, p < 0.001). 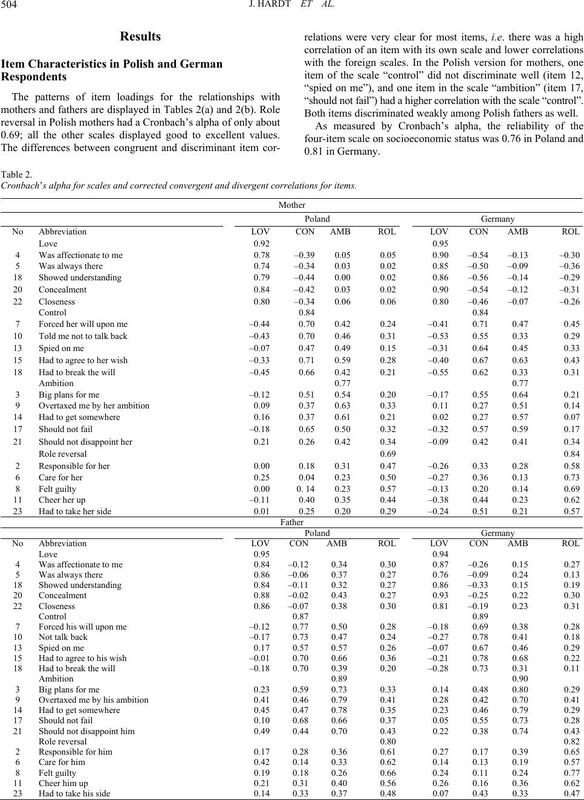 value in Germany than in Poland (t = 2.71, p < 0.01, d = 0.17). played higher values in Germany than in Poland. reversal” showed a slight decline in both countries. questionnaire seems to be appropriate for use in both countries. here probably reflect some differences between the countries. somewhat feminist thesis was developed by sociologists, i.e. that the family was ruled by the mother rather than the father. 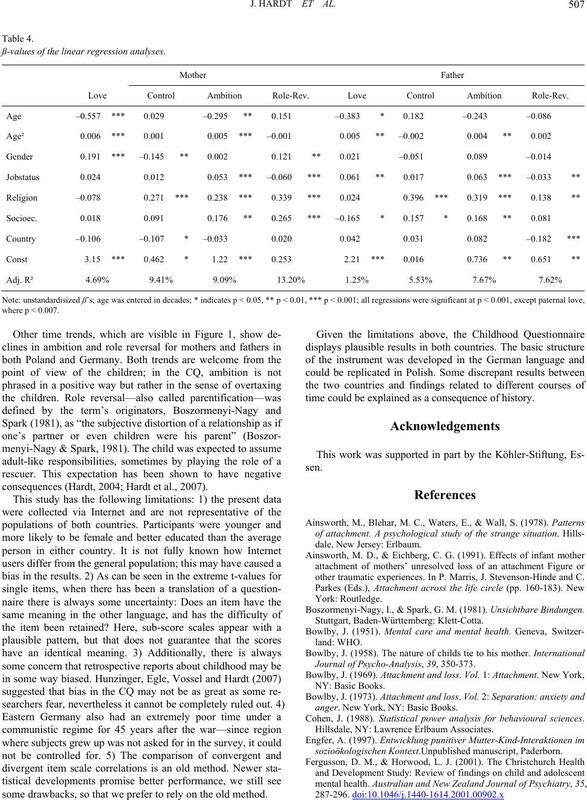 became insignificant in the multivariate analysis (Table 4). ß-values of the linear regression analyses. Love Control Ambition Role-Rev. Love Control Ambition Role-Rev. consequences (Hardt, 2004; Hardt et al., 2007). some drawbacks, so that we prefer to rely on the old method. time could be explained as a consequence of history. other traumatic experiences. In P. Marris, J. Stevenson-Hinde and C.
Boszormenyi-Nagy, I., & Spark, G. M. (1981). Unsichtbare Bindungen. Journal of Psycho-An a l y s i s, 39, 350-373.
anger. New York, NY: Basic Books. Cohen, J. (1988). Statistical power analysis for behavioural sciences. Hillsdale, NY: Lawrence Erlbaum Associates. sozioökologischen Kontext .Unpublished manuscript, Paderborn. Theory, Research and Practice, 1, 143-150. Gilreath, T. D., King, G., Graham, J. W., Flisher, A. J., & Lombard, C.
tungen: Die Rolle von Eltern-Kind-Beziehungen. Lengerich: Pabst. 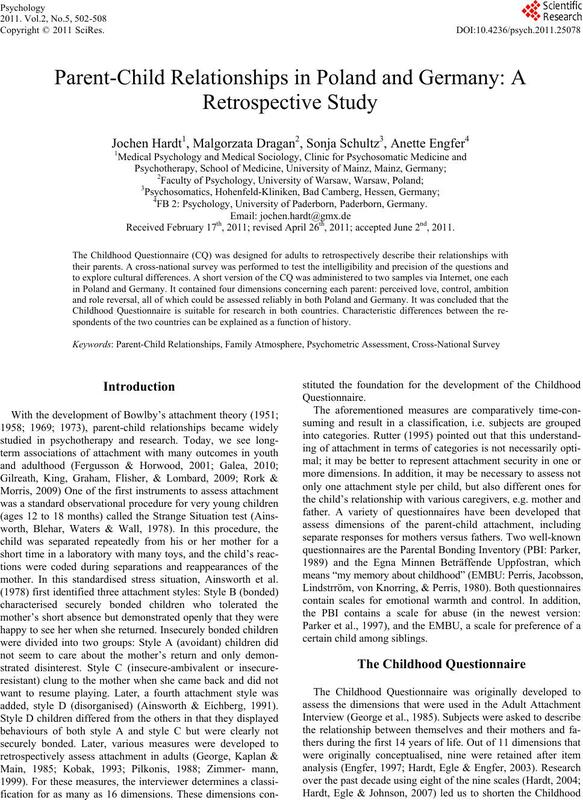 of Child Psychology an d Psychiatry, 45, 260-273.
schaftlichen Institut der Bundeswehr, 6.
properties reviewed. Psychiatric Developments, 7, 317-335. Perris, C., Jacobsson, L., Lindstrröm, H., von Knorring, L., & Perris, H.
control. Child & Family Behavior Therapy, 31, 220-235. Station, Texas: Stata Corpor at ion . Bindungsthe o r i e: G r und l age n , For s chu n g u n d Anw end u ng (pp. 203- 231) .